Arma: palato d’azzurro e d’oro di sei pezzi, alla banda del primo [azzurro] attraversante sul tutto. 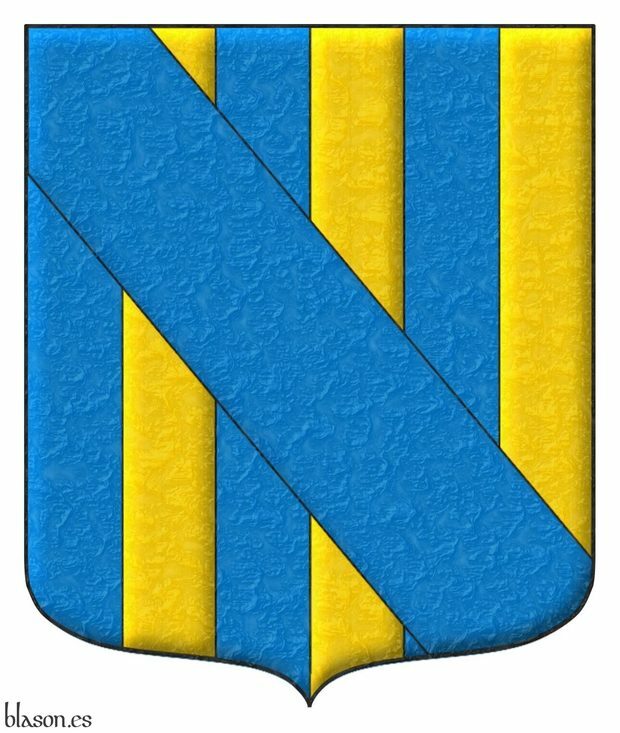 Paly of six Azure and Or; over all a bend Azure. Blazon keywords: Paly, Six, Azure, Or, Surmounted, Over all and Bend. Style keywords: Semi-circular, Parchment, Spot ink and Outlined in sable. Palato d’azzurro e d’oro di sei pezzi, alla banda d’azzurro attraversante sul tutto. Style keywords: Pointed and rounded, Crystalline, Illuminated and Outlined in sable. 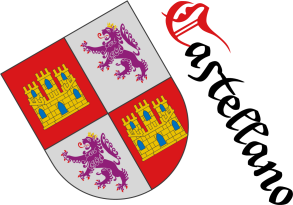 In the hoist the arms of Rudolph Andries Ulrich Juchter van Bergen Quast and in the fly pean, Gules and Gules, between two transverse bands Or, bearing the motto «Nemo me impune lacessit» in letters Sable, in the first compartment an Indian elephant statant Or, armed Argent, strapped over the belly, hump and rump Sable, cottised Or, charged on his left flank with a rose Gules, barbed Vert, seeded Or; seated on his neck a mahout, in his sinister hand a stick in bend sinister Argent; in the second compartment two leopard faces Or; in the third compartment a leopard face Or; and fringed compony Gules and Or. 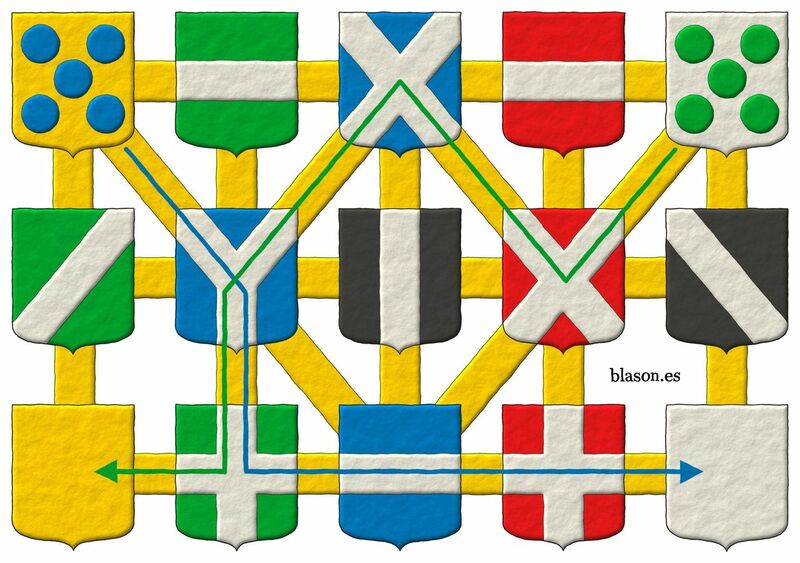 Credits: Kevin Derek Couling is the author of the English text of the blazon and Antonio Salmerón y Cabañas is the author of the heraldic art. 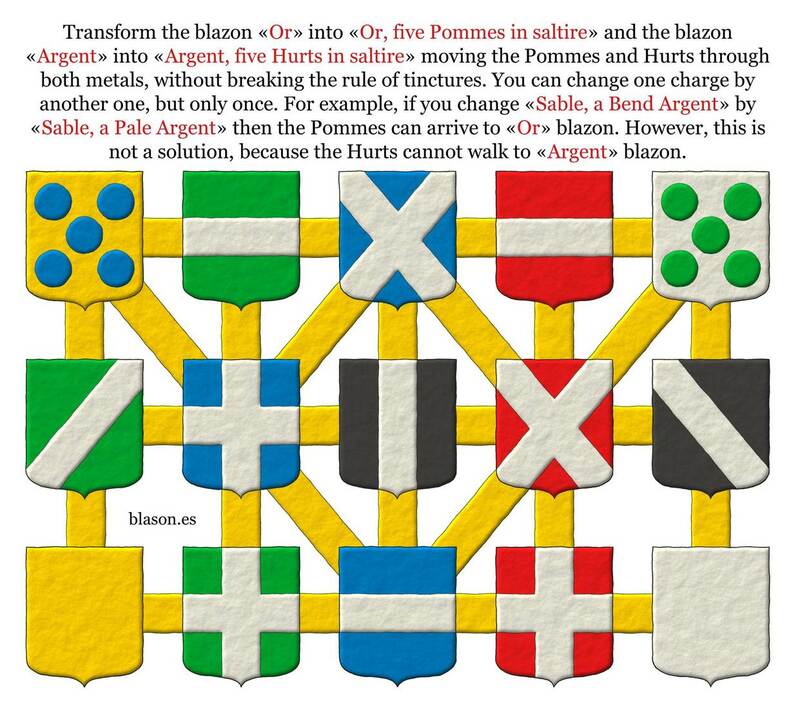 Blazon keywords: Pean, Gules, Two, Bend, Motto (motivation), Elephant, Statant, Or, Tusked, Sable, Bendy, Rose, Barbed, Vert, Seeded, Male figure, Sinister, Hand, In bend sinister, One, Head and Leopard. 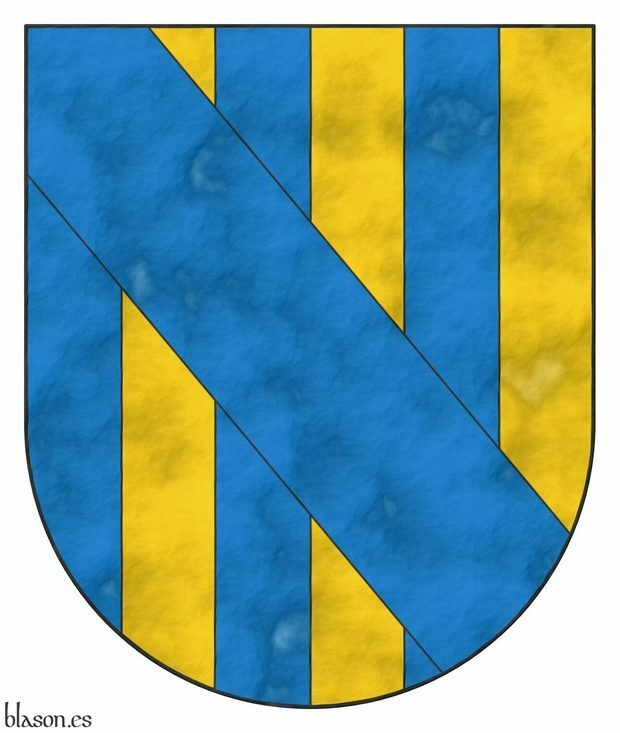 Riddle, Pointed and rounded, Azure, Bend, Flag, Barbed, Bend sinister, Seeded, Surmounted, Head, Pean, Bendy, Crystalline, Cross, Tusked, Outlined in sable, Two, Elephant, In bend sinister, In saltire, Coat of arms, Fess, Personal, Gifra, Vittorio, Gules, Illuminated, Interpreted, Juchter van Bergen Quast, Rudolf, Motto (motivation), Leopard, Hand, Semi-circular, Or, Paly, Pale, Statant, Pall, Argent, Hurt, torteau, pellet, pomme and golpe, Hurt, Pomme, Rose, Sable, Six, Sinister, Vert, Over all, Saltire and Freehand.